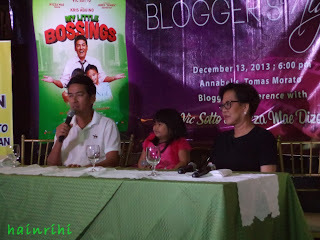 I attended the Bloggers’ Night of “My Little Bossings” last December 13, Friday in Annabel’s Tomas Morato, Quezon City, where stars Vic Sotto and Ryzza Mae Dizon and screenwriter Bibeth Orteza held a Q&A with bloggers only. It was my first time attending such event, so I was very excited. 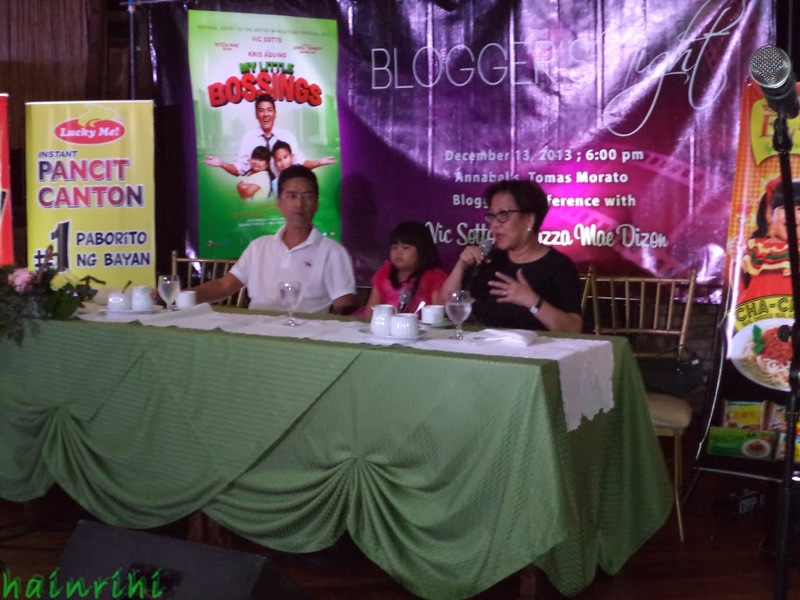 Plus it is about “My Little Bossings” and I really plan to watch this Metro Manila Film Festival (MMFF) movie entry when it starts showing in December 25. 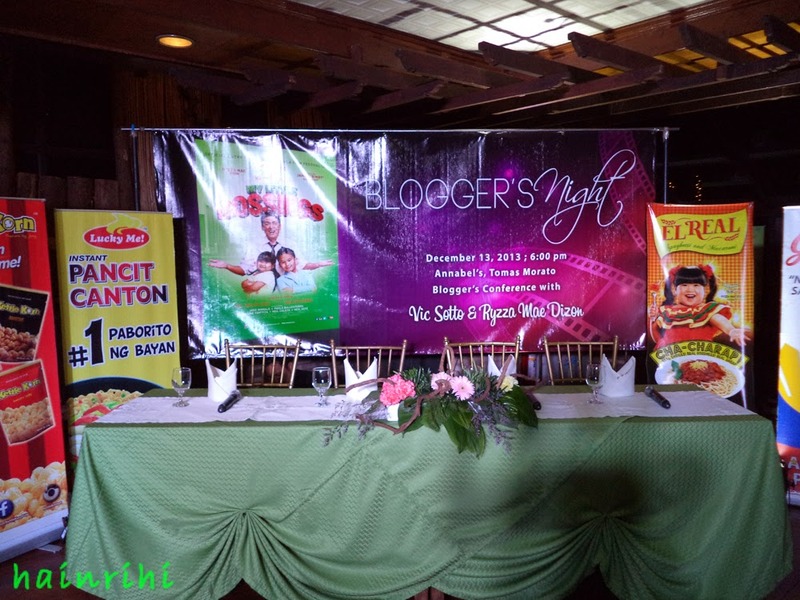 It was almost full house as bloggers welcomed the stars and Bibeth Orteza with open arms and cameras. Vic Sotto wanted to hold a bloggers’ conference because he believes “na malaking bagay kayo para sa ikatatagumpay ng pelikulang ‘My Little Bossings’” (we believe that you are a big deal in the success of the movie ‘My Little Bossings’). Once settled, the Q&A started with Melai Entuna of Style and Soul hosting the event. Around 5-7 bloggers asked questions and here some of the highlights of the Q&A. One of the questions I expected to be asked is why Vic Sotto decided to have a non-Enteng Kabisote MMFF movie entry. According to Vic, he just gave Enteng a break because he has been doing it for 5-6 years. For now, he wants a fresh material for the MMFF and this is where Vic got in touch with Kris Aquino to let Bimby be partnered with Ryzza---since Kris wants her son to be in a full-length movie. Thus came “My Little Bossings”. 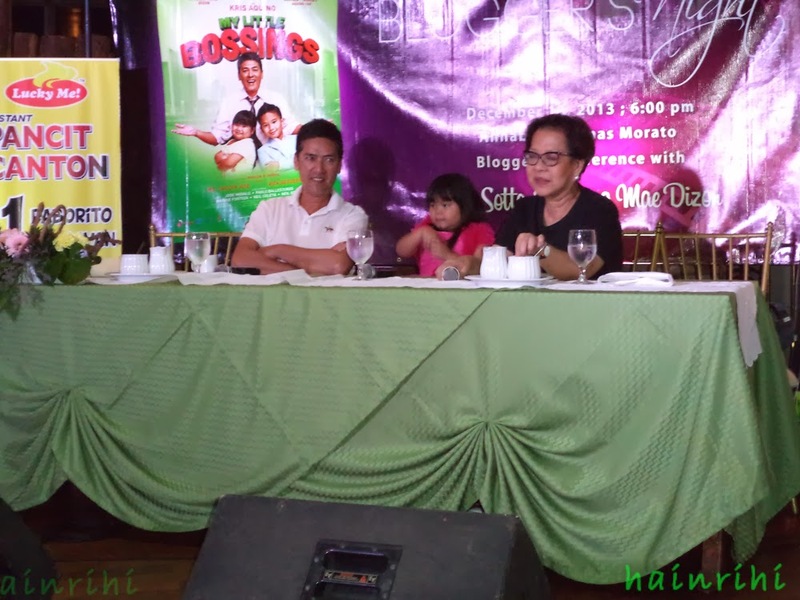 According to Bibeth, the movie was tailor-made for Bimby and Ryzza because she can’t think of anybody else who would play those roles except for the two kids. 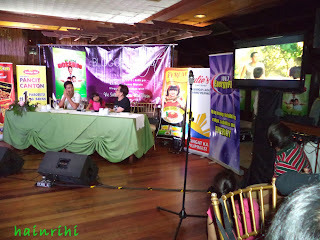 For Vic, it was not hard working with Bimby and Ryzza because working with kids is always a wonderful experience. Even way back when he was working with Aiza Seguerra in “Okay Ka Fairy Ko”, he learned it was always work and play at the same time with child stars. “Kasi I always see to it na yung trabaho namin is not really trabaho. Kailangan may kasamang laro kasi hindi pwedeng walang laro” (I always see it that work is not really work. There should always be play). In the case of “My Little Bossings”, Vic worked with two kids who are talkative and rough. 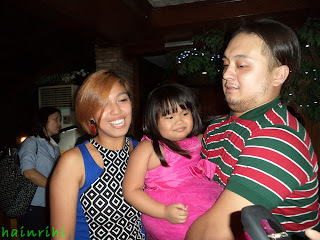 Bimby is the rough kid, Ryzza is the talkative kid. 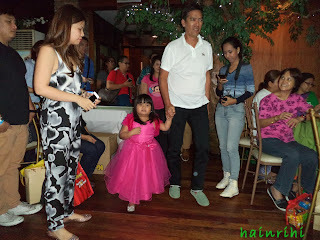 But unlike Ryzza--- where Vic has worked with even in Eat Bulaga---Bimby was a bit shy around the comedy actor at first. And since the relationship of Vic and Bimby in the movie started as being aloof with each other, they were like that even at the start. But halfway through the production, the two became close and played with each other. “Kaya for me, working with children, working with kids---especially talented kids like Ryzza and Bimby---and Aiza before---ay gumagaan ang trabaho, kasi may kasamang laro eh” (For me, working with kids--- especially talented kids like Ryzza and Bimby---and Aiza before, work becomes light because there is also fun and play). When it comes to the kids’ talents, Bibeth and Vic believe in them. 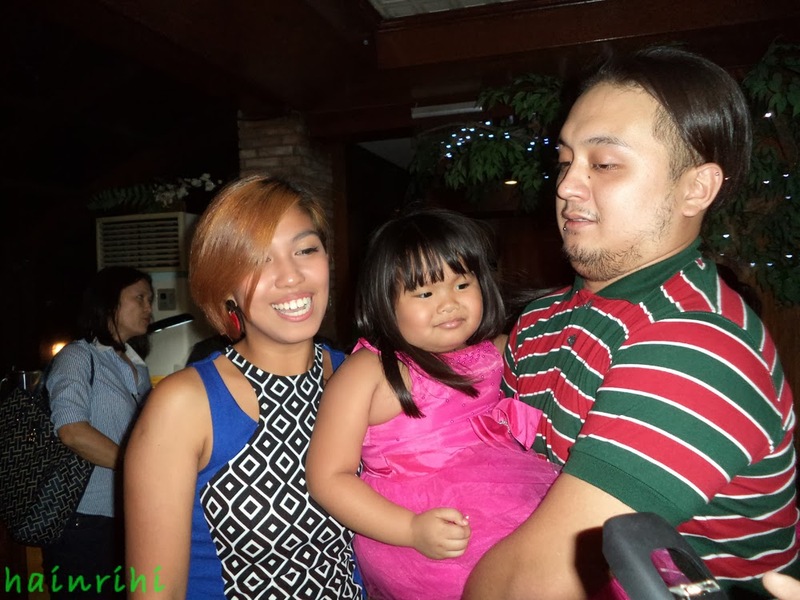 In fact, Vic sees “myself as a supporter and a believer in raw talents” like with Ryzza and Bimby. 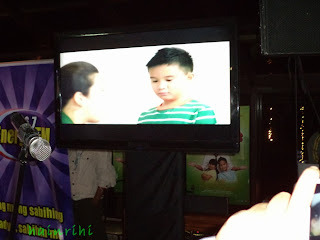 Surprisingly, he sees Bimby as very talented and if he continues on, Vic assures everyone he will be big. For Vic, as long as he can, he will help in honing the talents of the kids. 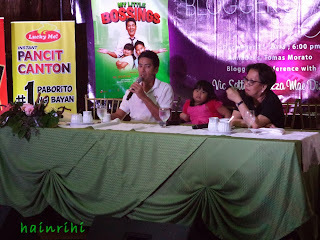 “My Little Bossings” not only focuses on the relationship between Torky and Justin, but also focuses on the relationship between Justin and Ching and one blogger asks about the relationship of Bimby and Ryzza in real life. Of course, at first they were uncomfortable with each other. But throughout the production, the two became “close na close” and now have a good relationship. 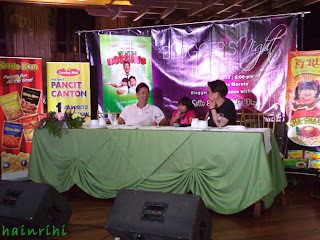 “Angat ang chemistry ni Bimby and Ryzza” and they executed their roles well in the movie. And you can expect that from the movie, according to Ms. Bibeth. 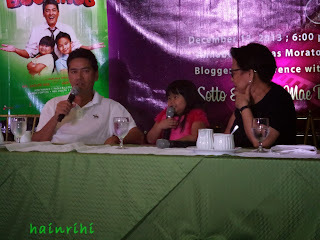 Vic also mentioned that Bimby was not used to doing a full-length movie at first. 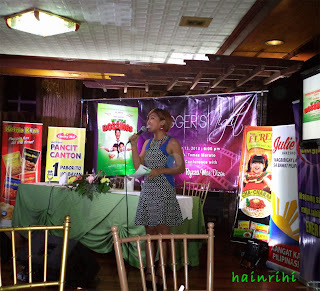 Compared to commercials where one shot is enough, Bimby had to memorize dialogues, hit your markers, know where to look and give emotions to your dialogues. 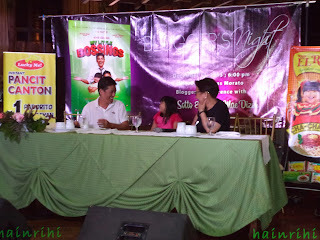 After a few shooting days though, Bimby was able to do those and Vic saw that he has talent to give emotions to his dialogues. For him, Bimby is not only a good kid, but a talented one as well. Same goes with Ryzza---thus making the chemistry between the two more fun and entertaining. Bibeth: Ako, thank you. Thank you for having me here tonight. Please make your own feedback known after you watch the movie. I’m very, very proud of it. Ryzza: Thank you, thank you and thank you. Anyway, I’ll be making a review of “My Little Bossings” after watching it. 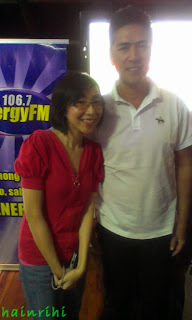 I encourage you to watch it because almost all of Vic Sotto’s MMFF movies are very funny, entertaining and educational. 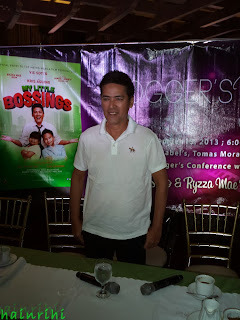 Catch my “My Little Bossings” in your nearest theaters when it starts showing on December 25, 2013, starring Vic Sotto, Kris Aquino, Ryzza Mae Dizon and James “Bimby” Aquino Yap. It also stars Aiza Seguerra, Jaclyn Jose, Jose Manalo, Paolo Ballesteros, Barbie Forteza, Neil Coleta, and Neil Sese from the direction of Marlon Rivera. Story and screenplay by Bibeth Orteza.